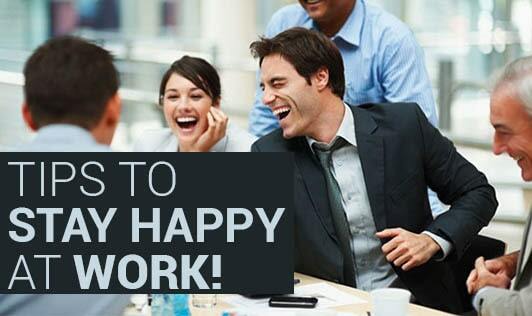 Tips To Stay Happy At work! Most of us suffer from some sort of work related stress - like Monday blues, an annoying boss, boredom at work etc. This stress eventually eats into our daily lives, thereby affecting our overall health. •Think Positive - Stop negative thoughts, as it can increase your stress and the chance of falling sick which in turn affects your work and healthy life. Remain optimistic and view your tough times as a challenge and an opportunity. This will help build your confidence and spirit. •Keep your personal problems away from your work - Drawing a line between personal and professional life will give you the right mindset and increase your efficacy at work. •Develop a nest and network at office - Office is the place where you spend maximum waking time, even more than at home. So make yourself comfortable while working. Mingle with your colleagues of similar mindset and share your thoughts and ideas. This will help reduce stress and pressure at your work place. •Take sufficient breaks - However busy you may be, take short breaks like a coffee/tea break, call a friend, grab a quick bite or get off your seat to drink water in sips. It can help you de-stress and give a vent to your negative energies. •Keep on learning new things - If you feel you are not being mentally stimulated enough, consider doing some training or a course that is work-related. Voice out your feelings and bring in innovative thoughts to help grow the company. •Prioritize your work - If you feel you are pressurized with loads of work, speak to your boss to negotiate the work deadlines, if needed. Try to make your working hours flexible or try to get out from office early 2-3 times a week so that you get time to spend with family and friends. This can be a stress buster. •Keep a smile on your face - Whatever difficulties you may have, always keep a smile on your face to overcome all kinds of hurdles. This will bring in patience and you will find the beauty of your life. Remain stress - free and happy at work. You will be more productive and definitely succeed in your career.